State Meet: Audrey and Claremont are Champs! 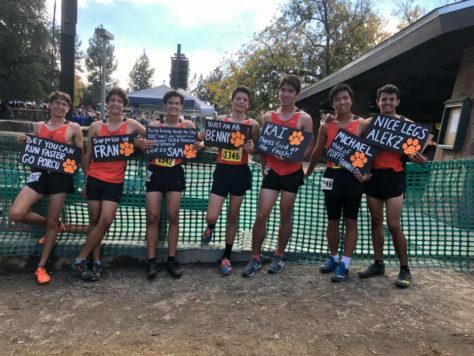 Eight San Gabriel Valley teams and eleven individuals competed Saturday in the California State Cross Country Championships, on the 5000 meter course at Woodward Park in Fresno. Five of the eight teams were here in 2017, with the Claremont and Flintridge Prep girls looking to defend respective winning streaks of two and four years. The Wolfpack extended the streak to three, and finished first in a merge of all of the competing teams, earning a place in next week’s Nike Cross Nationals in Oregon. They’ll be joined in Portland by Chloe Arriaga (Sr, Walnut). Chloe finished 7th overall (and 4th in DI) to qualify individually, and led her team to an outstanding 4th place finish in Div I.
Prep fell a little short, earning a 3rd place finish, their 8th time on the State podium. 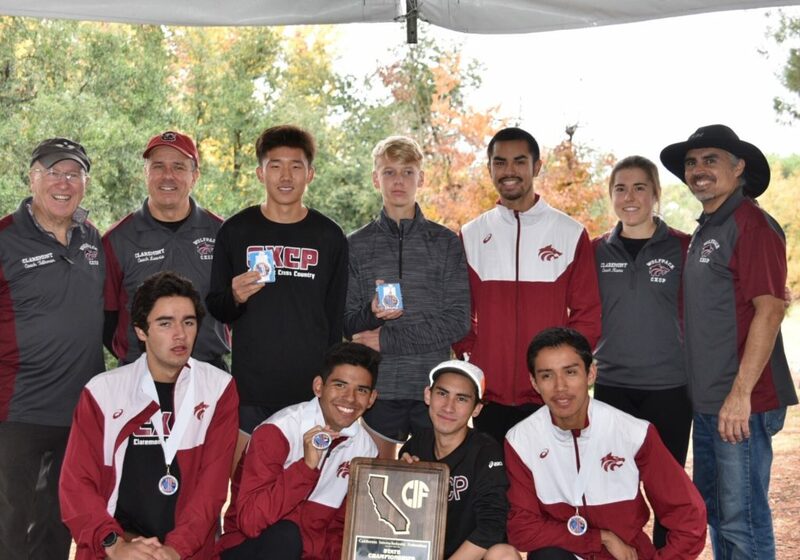 The Claremont boys also had a strong day and earned their third podium placing ever with a third-place finish in a exceptionally strong Div. II race. In Div. IV, Mayfield soph Audrey Suarez became the SGV’s first individual champion in several years with a 17:44 effort. 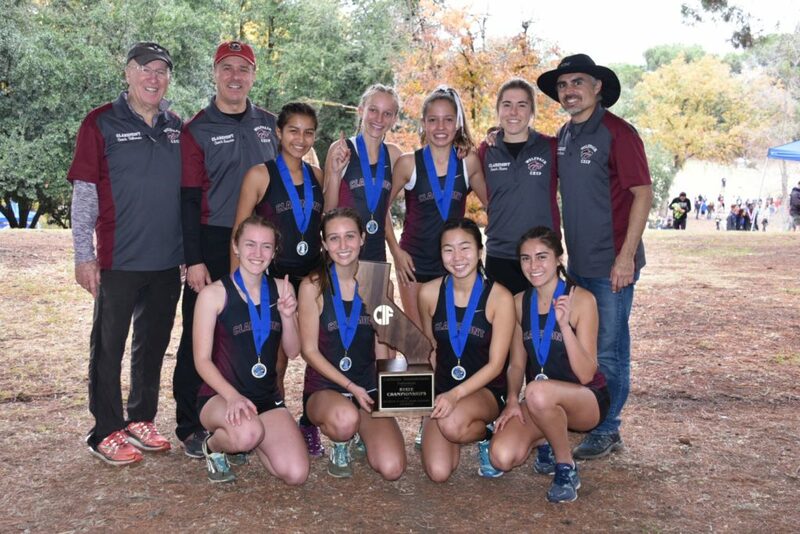 Joining her in individual, Top 7 honors were Chloe Arriaga, Maddie Coles (Fr, Claremont) – 2nd/17:44 in Div. II, and Noah Hibbard (Sr, Arroyo) who was 2nd/15:05 in the boys Div. II race. Links to the Official Results, updated All-Time Lists and coverage of each of the races after the jump. California was 7th and final qualifiers from the Southern Section, the fourth time they’ve advanced in the five last years after staying home last year. They came into the race unranked in the State, and essentially held their place, finishing 13th in a solid performance. Their top performer was Angel Salinas 62nd/16:03. Arroyo’s Noah Hibbard capped an outstanding senior year by finishing 2nd in 15:05 – #9 All-Time SGV on this course. Noah was with the leaders from the start, and then made a strong move into 2nd in the second mile, and held his spot while being challenged all the way to the line. Noah turned down an invitation to compete in the Nike Cross Nationals in favor of trying to qualify for the Footlocker National XC meet. 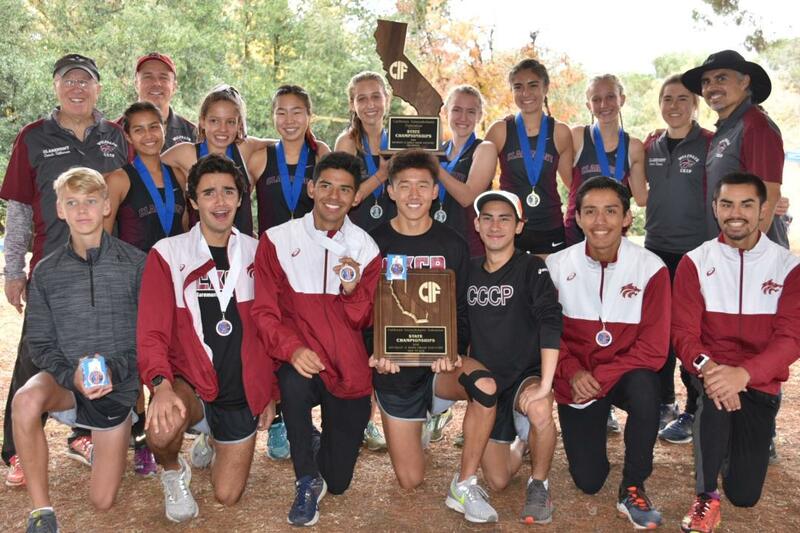 Claremont were 2nd at CIF Finals and ranked =2nd in the State and were hoping to move up for the win. Running near the front through two miles, they finished third. They had their usual tight grouping, with only 24 seconds separating 1-5, but it wasn’t enough in this really strong field. Ryan Cowgill (Sr) was the Wolfpack’s top finisher in 13th/15:33 and was joined by fast-finishing junior Adam Trafecanty – 19th/15:42 among the top finishers. Walnut were 6th at CIF and are #7 in State, to advance to the State meet for the first time in many years, and maybe ever. At least one of their runners was struggling with an injury, so even holding that spot was uncertain. The girls ran ambitiously, ranking 3rd at the first two splits, and were just edged out in the final mile to finish routh in a really outstanding race. Emma and Chloe Arriaga were the team leaders as they’ve been since the first race as frosh. Chloe finished her career with a 4th/17:39 finish that makes her 4th All-Time SGV on this course. Emma was just a second off her life-time best at 11th/17:56 overall. 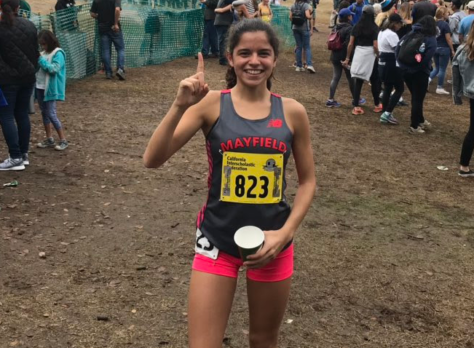 But the key to their success was soph Anastasia Sloan, fighting off a sore leg to finish 69th/19:12, and even bigger, a huge step up performance from junior Milo Santiago 72nd/19:13 – easily a 30+ second life-time best. There were no SGV teams here, but Hacienda League Champ Devin Hightower (Sr, South Hills) and Valle Vista champ Eduardo De Paz (Jr, Baldwin Park) had advanced as individuals. Hightower closed out his massively improved senior year with a 31st/16:14. De Paz, a soccer player who is still feeling his way into this sport, was an equally good 37th/16:19. There were three SGV teams in the top six here last year, but only Mayfield was able to return. Fifth in the SS Finals, and ranked =6th in the State, they essentially held their place with a narrow 7th place finish. The were out well and then made a strong move in the second mile only to give back one place heading to the line. 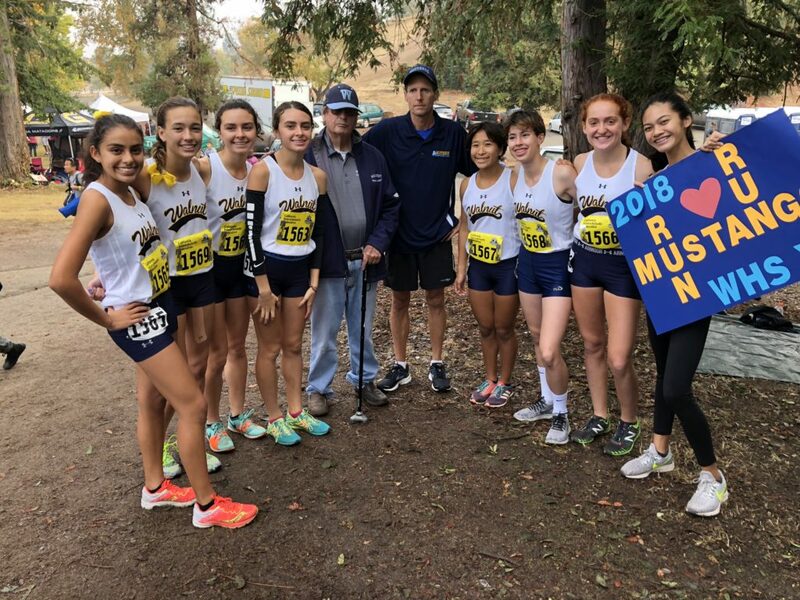 As noted above, soph Audrey Suarez won the State divisional championship with a really outstanding, 17:44, 12th best among all divisions, and =8th All-Time SGV here. Among the individual qualifiers, Lauren Nettels (Jr, FSHA) was 36th/19:17, Olivia Paez (Sr, Bishop Amat) 53rd/19:36 and Ellaney Matarese (So, La Cañada) 57th/19:39. Flintridge Prep, came into the meet ranked 3rd after a second-place finish in CIF. After missing the podium last year, they were hoping to add to their SGV best total of 16 podium finishes. But that was not to be as they finished 6th. Senior Carson Hasbrouck led the team with a 16th/16:26 finish. Three SGV individual competitors were Nathan Vallejo (Sr, Southlands Christian) – 30th/16:25, Owen Serricchio (Sr, La Cañada) – 32nd/16:27, and Nathaniel Estrada (Jr, Pioneer) – 50th/16:38. Flintridge Prep faced a steep climb to defend their State title, but their streak ended at four behind two outstanding teams. They ran gamely from the start, and were second at the first split and finished well to hold third. They were led by senior Haley Allen – 24th/19:44. Webb soph Lily Miller finished just ahead of her with a really nice 23rd/19:43 finish.